In the 1920s, Australia’s urban communities were introduced to Ugg boots. Artisans crafted these sheepskin shoes for workers and travellers who spent a lot of time outdoors in cold temperatures. The inner fleece material allows the wearer’s feet to keep warm. 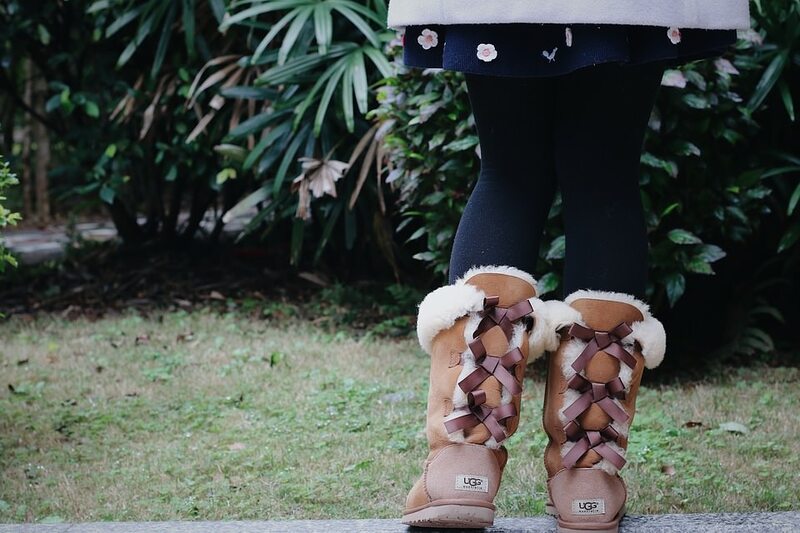 Throughout the 20th century, Ugg boots were introduced to other countries around the globe. By the time the 1990s came around, Ugg boots had entered the fashion sphere. People wore them as slippers or casual wear. The trend eventually slowed down for a bit. But by the late 2000s, it picked up again and has continued to this very day. 1. Don’t wear Uggs with bare legs. Uggs are much thicker than your average boots. If you are wearing lighter clothing below your waist – like stockings or bare legs beneath a midi or mini skirt – the outfit won’t look right with thick Ugg boots on your feet. 2. Do pair jeans with your Ugg boots. Jeans and Ugg boots are a classic fashion look. Just be sure to choose jeans that are not baggy. Otherwise, the ensemble might look more like pyjamas than casual wear. Skinny or straight-cut jeans should do just fine. If you have leggings, they can work, too. 3. Don’t wear Uggs with formal clothing. Whether you are a woman who wears dresses or a man who wears suits to formal events, do not wear them with Ugg boots. Ugg boots don’t exactly have a glamorous appeal to them. Only wear casual outfits with your Ugg boots. 4. Do wear socks with your Ugg boots. Remember there is organic fleece material inside your Ugg boots. If you are putting your bare feet in them, they are likely going to sweat because of all the heat trapped inside. Sweat will cause the fleece to stink, and the fur will ultimately be ruined. 5. Don’t wear Uggs in the rain. Ugg boots are not meant to be worn in rainy or muddy environmental conditions. You shouldn’t wear them in snowy conditions either, despite how warm your feet will feel in the boots. For the same reasons that you shouldn’t sweat in your Ugg boots, moisture from rain or snow can also ruin the fur and cause it to stink. If you need to give your boots some water protection, there are special conditioners that you can spray onto your boots for this purpose. 6. Do wear light-coloured Ugg boots. Sheepskin is naturally a light tan colour. If your Ugg boots are of a darker shade, chances are the material was dyed to that colour. This dye will likely rub off onto your leg or pants if it encounters just a little bit of moisture, even sweat. The colour of the boots will then fade as a result. 7. Don’t wear your Ugg boots while cooking or smoking. Ugg boots should not be worn in kitchens because all the fumes from your cooking will sink into the sheepskin. This will cause your boots to retain the smell of whatever it was that you were cooking. If it only happens a few times, the smell should go away after a couple of days. But if it is a recurring situation, then you may have a tougher time getting rid of that smell from your boots. For the same reason, you don’t want to smoke tobacco around your boots, either. Next Next post: A Marriage ceremony Planning Checklist For Every Bride!